Today’s world is fast-evolving. As innovations are taking over the business world at full tilt, keeping pace with all emerging technologies is not an easy task. Due to recent developments in big data storage and cloud computing, artificial intelligence, commonly abbreviated as AI, is making great strides in enhancing its accuracy and efficiency. Introduction of such technologies as AI and machine learning (ML) in different industries is drastically on the rise, powering our businesses and daily lives. Artificial intelligence, abbreviated as AI, is a field of computer science, which allows machines to imitate human behavior. AI enables machines to perform tasks and processes, such as planning, decision making, reasoning, problem solving, etc. That so far used to be considered to belong solely to human functions. AI technologies can add great value to businesses, revealing new insights and creating better solutions. A growing number of companies start to transform their core processes and business models by taking advantage of AI capabilities. 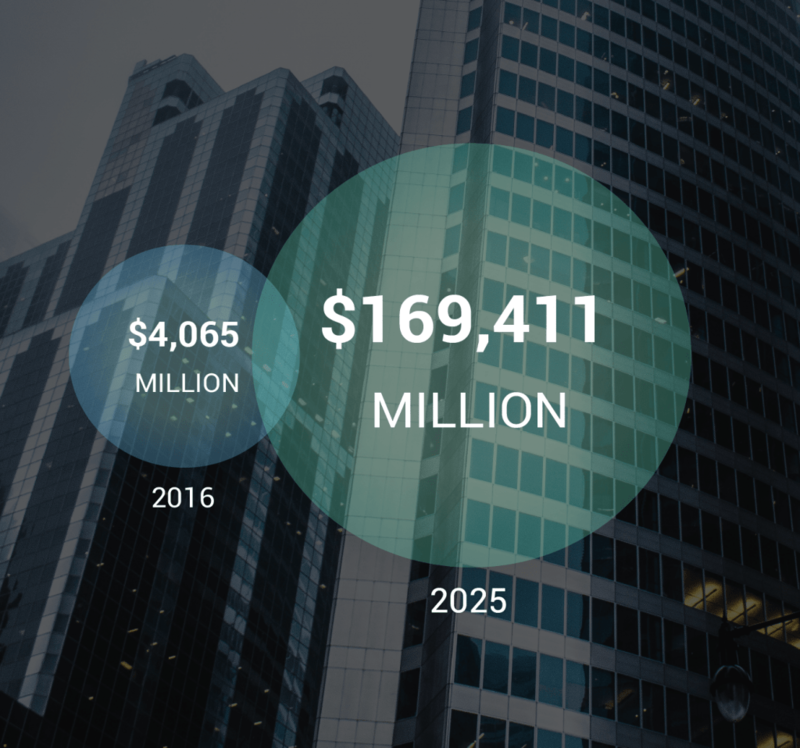 According to Artificial Intelligence Market report, the artificial intelligence market accounted for $4,065.0 million in 2016, and is expected to reach $169,411.8 million by 2025, growing at a CAGR of 55.6% from 2018 to 2025. McKinsey Global Institute believes that implementation of AI solutions is a key to companies’ success in today’s world. In its discussion paper Artificial Intelligence the next digital frontier (June 2017) it is maintained that companies «that combine strong digital capability, robust AI adoption, and a proactive AI strategy see outsize financial performance. Digital native companies made some of the most significant and earliest investment in AI, providing test cases for potential return on investments in AI». According to McKinsey Global Institute, the total annual external investment in AI technologies was $8 billion to $12 billion in 2016, while Machine Learning attracted approximately 60% of that investment, which can be explained by the fact that ML is a key enabler for many AI applications. 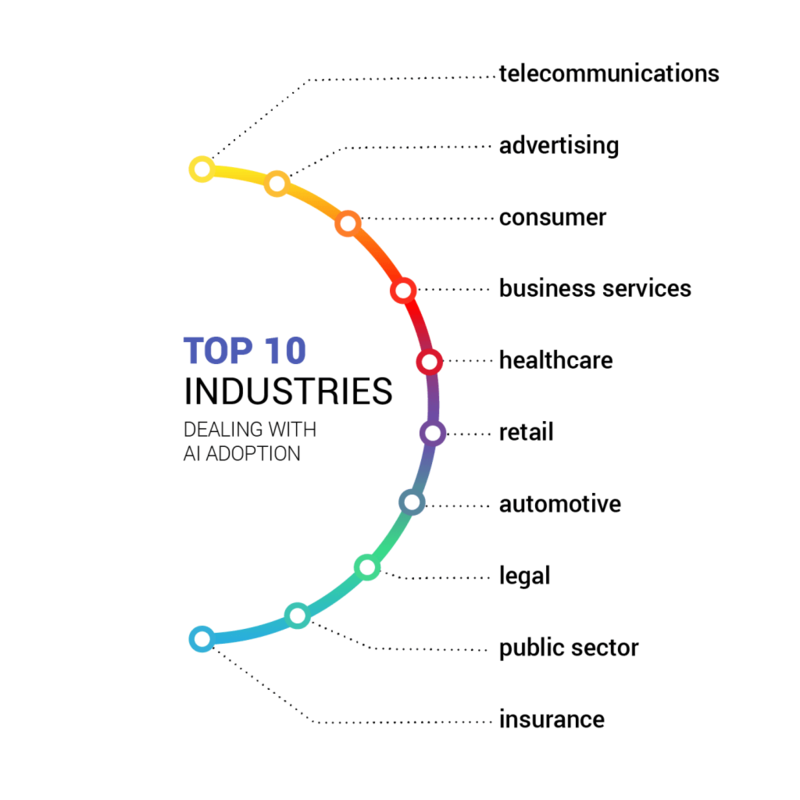 A report from market research firm Tractica forecasts that the top 10 industries dealing with AI adoption and spending between 2018 and 2025 will include telecommunications, consumer, advertising, business services, healthcare, retail, automotive, legal, public sector and insurance. According to Tractica research director Aditya Kaul, the company views the challenges of AI implementation as “part of the maturity curve for AI” as more and more companies are introducing AI technology into their operations. Forrester, one of the most influential research and advisory companies in the world, has not left AI-boom untouched. Professor Michele Goetz, in his article about Data Performance Management said, «Data performance management is a must-have, not nice-to-have.». The world is changing at an exponential rate with the growing size of data collected across the globe. Today, data are becoming more relevant and meaningful for all industries, making AI and ML the most demanded technologies. Data, AI and ML are merging into a synergistic relationship, as only AI with ML-powered systems can transform massive amounts of data into knowledge, decisions and actions. International Data Corporation (IDC), a global research company, stated in its report that AI will positively impact The Customer Relationship Management (CRM) market, enhancing productivity and business revenues. IDC predicts that AI-driven technologies for CRM processes will boost global business revenue from the beginning of 2017 to the end of 2021 by $1.1 trillion. Within this period, salesforce customers are expected to account for $239 billion of the total aggregated revenue and over 155,000 directs jobs. Nearly half of AI adopters acknowledge that 50% of their CRM activities are carried out using the public cloud. This, in its turn, puts forward a challenge for the AI vendors who are to deliver AI to their customers by embedding it into their applications. 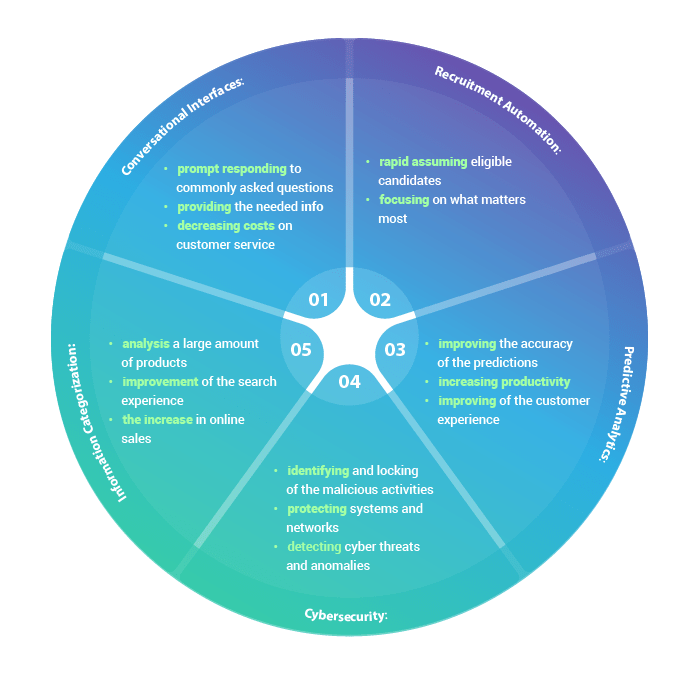 The report also identifies the main areas of CRM activities that can reap benefits from AI, namely corporate marketing, product or service marketing, marketing operations/field marketing, customer support, digital commerce and customer analytics. Accenture, a global management consulting and professional services company, says, «A new factor of production—artificial intelligence (AI)—is emerging that can help kick-start profitability». According to Accenture, AI could boost average profitability rates by 38% and lead to an economic increase of US $14 TM by 2035. In the manufacturing industry AI-driven solutions aimed at handling defective machines and inactive equipment are predicted to enhance the profit share by 39%. The AI-driven conversational interfaces are the most sought-after AI applications. A chatbot or a virtual assistant is a computer program, which is able to perform a conversation in natural language. In essence, such an interface can be extremely useful for basic information requests, as it can immediately answer commonly asked questions or provide the needed information, allowing customers to get a personal and accurate interaction. Companies can decrease their costs on customer service employees and invest more in other areas, such as marketing, sales, and engineering. The biggest technology giants have already introduced their own chatbots. Apple implemented Siri in its smartphones in 2010, IBM Watsons was introduced in 2011, the Bixby Samsung voice assistant appeared in smartphones in 2012. Alexa has started to answer questions in 2014, and the Google Assistant emerged on the market in 2016. According to Mordor Intelligence report, Chatbots Market was worth USD 864.9 million in 2017 and is forecasted to reach USD 3146.4 million by 2023, growing at a CAGR of 24.1% over the period from 2018 to 2023. AI can make the recruitment process easier and less time-consuming. By applying the power of recruitment automation, eligible candidates can be found more quickly, as AI-powered systems can review resumes and interview potential employees, collecting sufficient data from hundreds of thousands of candidates to identify the ideal fit. Recruitment automation will give companies more time to focus on what matters most. Using AI predictive analytics enables companies to make more accurate predictions and drive improved performances. AI-powered systems can analyze a huge amount of data from various sources inside and outside the organization, making forecasts based on the analyzed information. This can improve customer experience by enhancing personalization rate, product and searching recommendations. Implementing AI security systems can help organizations to spot and block malicious activities inside their networks, thus protecting their systems and networks where company data are stored. This AI-driven solution can detect cyber threats, privilege abuse and find anomalies. One of the many useful AI applications is information categorization, which can be described as the smart classification of visual data into categories. With applying AI categorization solution, companies can reap a number of benefits. For instance, ML techniques can analyze a large amount of products, placing products in different categories in order to enable more accurate search results. This can not only save time and efforts, but also improve the search experience, enhance online sales, as well as help companies stay ahead in the competitive world. Another area where AI information categorization has found its use is price categorization. By implementing AI technologies, companies can determine and optimize prices with a whole new level of precision. AI systems can take a large variety of data into account, analyze them and predict, for instance, what price the customers are going to find acceptable or their receptiveness to special offers. This AI solution allows companies to target buyers with more precision and identify the exact level of discount needed. As a profound technology, AI can offer a number of benefits for companies in different industries, optimizing operational processes, improving customer experience and reducing man-hours spent. Extending human capabilities, AI technology does not only make companies’ operations more efficient and cost-effective, but provides them with an insight into human behavior, people’s preferences and goals. Companies that have already started to exploit AI benefits are boosting their productivity level and enjoying sustainability and growth.